Giovanni Barbaro's Mediterranean Maidens portrait studies. Mediterranean Maiden, watercolour on paper, signed G. Barbaro. c1900. One of a pair. Dimensions : Frame : 578mm x 462mm x 24mm. Image : 360mm x 260mm. Displayed within conservation mount in marbled gilt frame. 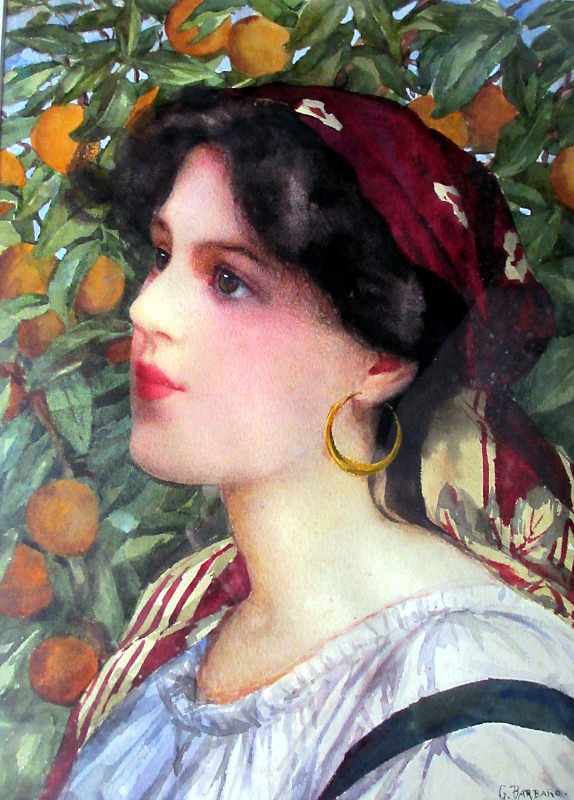 The location for this study is similar to the "In an orange grove" study displayed on the previous page. Likewise, this portrait study is probably of Amy Barbaro. It is also the basic study from which the "Spanish Girl" colour postcard, also displayed on the previous page, is derived. Giovanni Barbaro's signature signed as G. Barbaro. c1900. Mediterranean Maiden, watercolour on paper, signed G. Barbaro. c1900. Second of a pair. 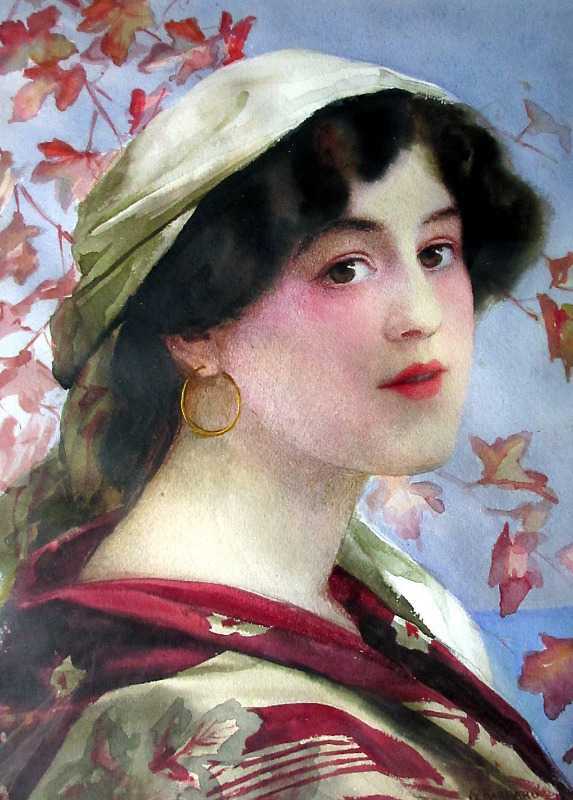 This portrait study is the basis for the "Italian Girl" colour postcard displayed on the previous page. The artist's signature, signed as "G. Barbaro", lower rh corner. Alternative portrait study of the Girl in an Orange Grove set against flowering cherries, watercolour on paper, signed G. Barbaro. Dimensions : 172mm x 228mm. Framed and glazed. Courtesy of Peter Webb, Brittany, France. Amy Barbaro in the Orange Grove, watercolour on paper, signed G. Barbaro. Dimensions : 240mm x 170mm. Courtesy of David Knapman, England. (Owner). Detail from the Three Camels study signed G. Barbaro, c1910. Is this Giovanni? G. Barbaro, Three Camels study, watercolour on paper. c1910. Dimensions : 290mm x 480mm.